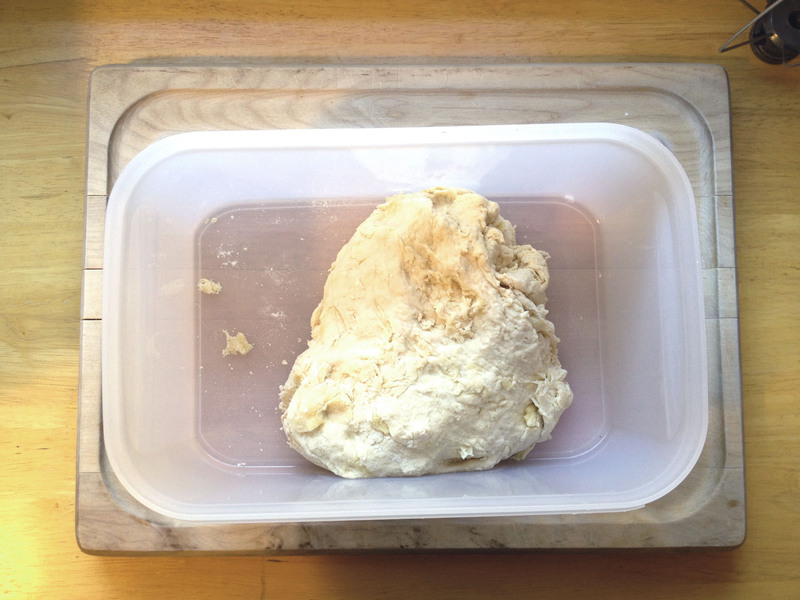 This year I have been experimenting a bit more with making bread dough from scratch. I have dabbled over the years, but I have been trying to make more effort this year to find a go-to dough recipe. Over the years I have tried a few different recipes I found on the internet. I didn’t always have a stand mixer either, which makes dough making A LOT more time consuming. 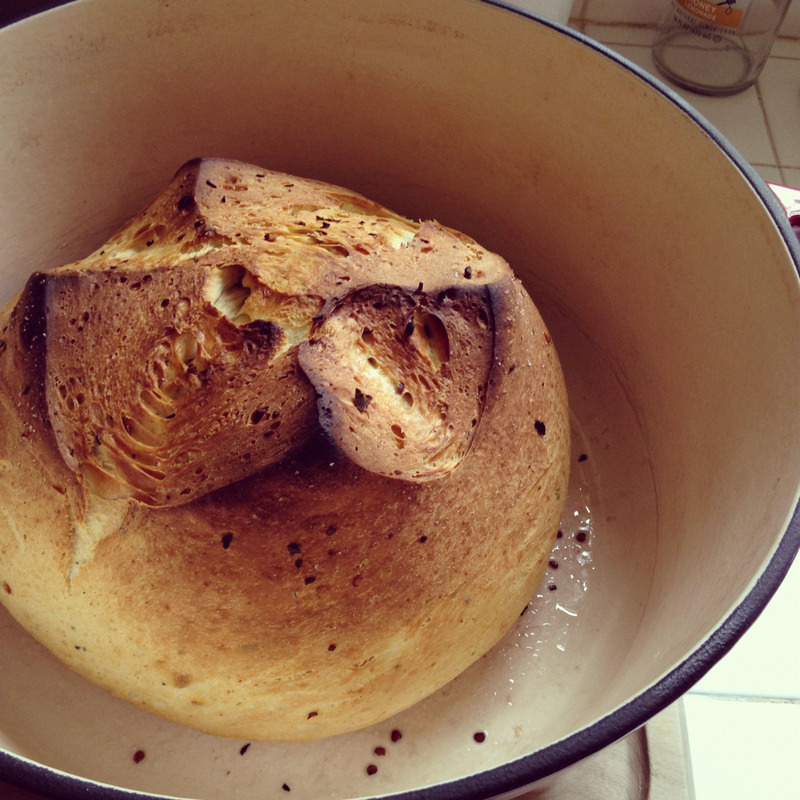 So, once I actually got a kitchen aid mixer last year – no more excuses about making bread dough! One of the first things I made with my then new mixer, was this great bread that I found on Posie Gets Cozy. It is so good, and super easy – you just cook it in a dutch oven! Eat it up quick, as in my experience it didn’t last too long. It won’t be hard, especially warm out of the oven. So, this year I wanted to work on making my own pizza dough. Brad and I LOVE pizza. And it’s fun to make it at home and get it just how you like it. 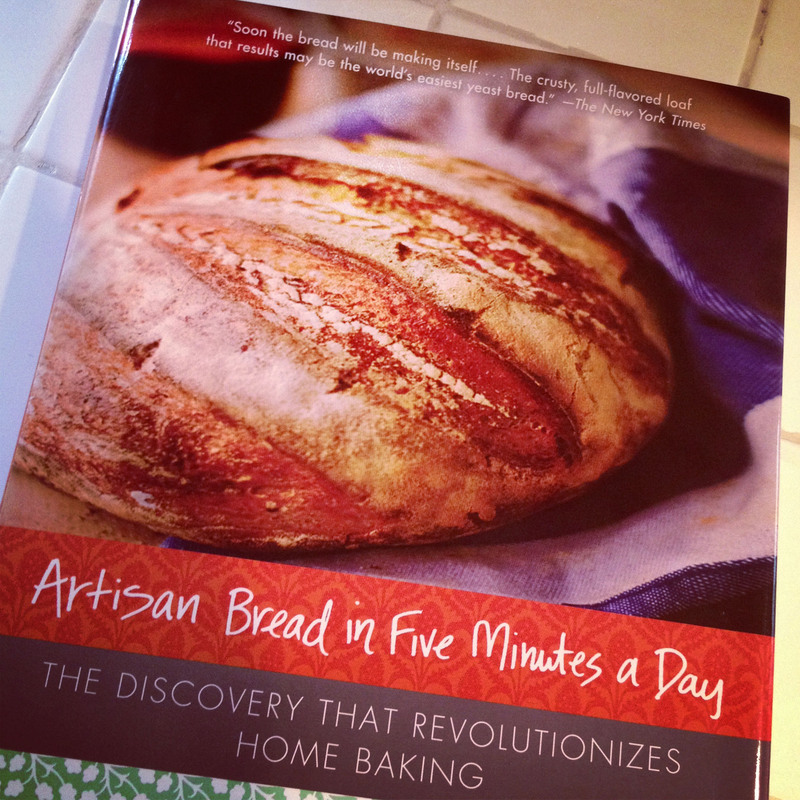 So I heard good things about a book called Artisan Bread in 5 Minutes a Day – so I picked up a copy and gave it a try. It is based around the idea of making up big batches of dough that you have on hand and can use for up to 12 days. Plus the recipes are super easy to double or half. I have only tried a couple of the dough recipes – but so far it’s been pretty good and VERY easy. 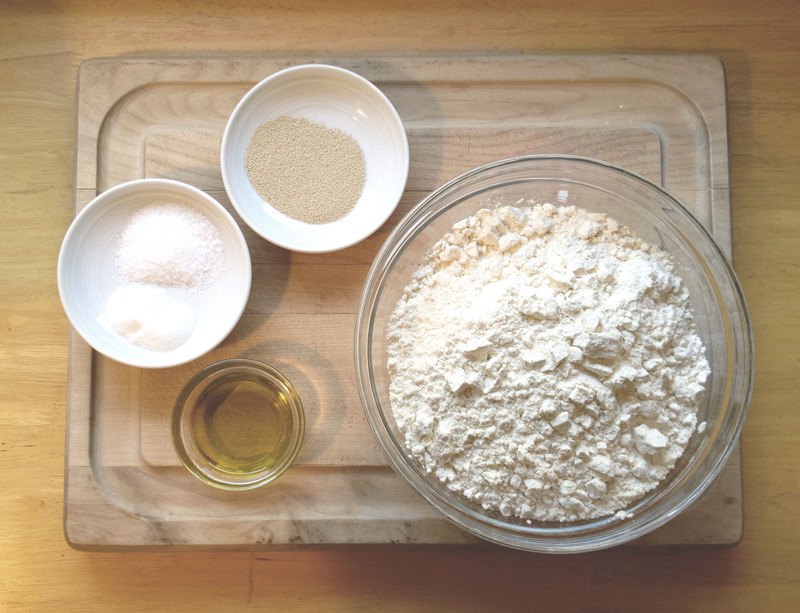 All that is needed are these few ingredients: water, oil, salt, sugar, yeast, flour. You mix up everything, except the flour. Then add in the flour. I mix with my stand mixer, but it’s just as easy to use your hands. Then you let it rise in a large container for a couple hours. Once that is done, pop it in the fridge. That’s it! Then you have bread dough ready to go for the next 12 days. I recommend this book if you are looking to try your hand at making bread dough. It includes recipes for making peasant loaves, flatbreads & pizzas, enriched breads & pastries. I look forward to branching out and trying more of them! So, now the dough waits to be transformed into pizza! I will snap some photos of how it turns out tonight and post next week. 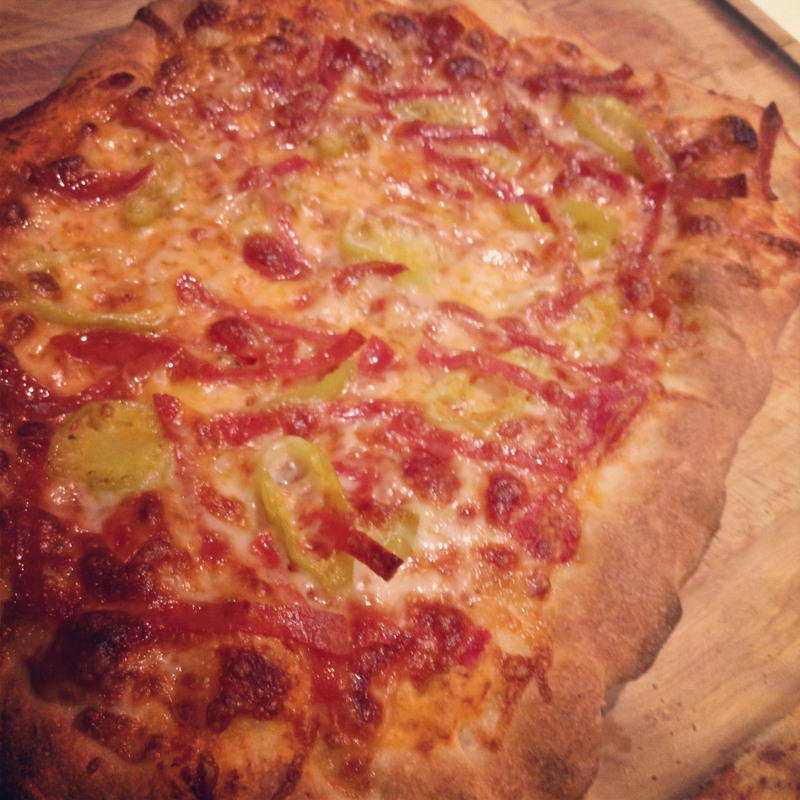 Until then, I will end off with a photo of the first pizza I made using this recipe.